Patra's Peacock Collection - Stitched and Others. : A pair of matching doilies and a little notebook. A pair of matching doilies and a little notebook. These two doilies arrived from the USA last week. You've heard/read it here before, but this will be the last lot of embroidered peacocks I buy for a while. I have an enormous collection, and I'm finding that most of what I see on eBay now is a duplicate or very similar to what I already have, or a design that is so way out it doesn't appeal to me. As well as that, after our trip away this week, I'll need to reign in my spending (again) for a while. The only exception to all this is if I find something really special in an opshop in Darwin, and I think that is highly unlikely! Now for something different. My friend Val had a very busy blog for a year or so, but got a bit 'blogged down', so she has discontinued her blog activities for a while. But we have stayed in touch, and sometimes meet up for a coffee at the library, or go for a walk and picnic on a nice day. One of Val's many hobbies is paper-making and other paper-related crafts. 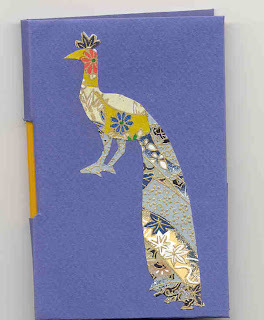 Last week she presented me with this little notebook she'd made just for me, cutting a peacock motif from pretty paper and sticking it on the front. Inside is a blank pad and pencil. What a beaut gift! I love notepads - I've got several, and they all have a separate purpose. Pretty doilies! The notebook is wonderful. Your friend is very talented! 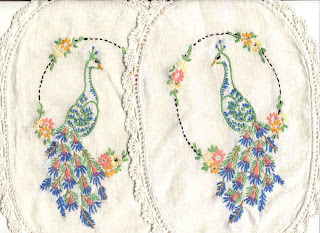 Your peacock collection is priceless...I think my Mother did some of these patterns when I was growing up, I don't think she kept any of them, she probably sold them at one of her garage sales for 25 cents :). One can only smile, right? hello! , im impressed by the doilies.